Greene County beat out Taney County — home of Branson, Missouri's entertainment capitol — by generating $521 million in economic impact from tourism. Taney County racked in $461 million, followed by $160 million in Jasper County and $143 million in Stone County, according to the report. Tourism-related industries employed 16,584 people in Greene County and 10,612 people in Taney County, according to the Missouri Division of Employment Security and a University of Missouri-Columbia study. Southwest Missouri as a region finished second to the northwest region, which experienced a $2.5 billion economic impact, according to the report. Congressman Roy Blunt's office was unexpectedly graceful last friday concerning a potential primary against Sarah Steelamn. A representative from Blunt's office said, "We have a great relationship with Sarah Steelman." Before Senator Kit Bond stepped down from a re-election bid the dialogue between camp Steelman and Kit Bond was anything but rosy. In fact, a St. Louis Dispatch report revealed a lawsuit by Steelman's husband David against Kit Bond's alleging corruption was inevitable. I caught up in David Steelman at Lincoln Days in Kansas City where Steeman stated since the committee to re-elect Bond was dissolved there was no reason to pursue legal action. A former member of Steelman's staff stated Sarah was committed to running a clean race calming fears of a knock-down drag out fight bruising an already wounded Republican party. After a series of public appearances throughout the state Roy Blunt spoke to Republican party leadership at Missouri Lincoln Days where he responded to rhetoric pinning him as a Washington D.C. insider. Blunt said, "Yes, I have more experience than Carnahan in Washington, I also have more experience as a state auditor and as a university president...."
The focus on Carnahan bypassed a direct attack on Steelman who has advocated change in the Republican Party away from a culture she's characterized as an good-old-boy's network. Both Carnahan and Blunt have a political advantage, they can distribute press releases from official government streams which can greatly lower the cost of generating newspaper write-ups. Before former Governor Matt Blunt dropped out of the Missouri Gubernatorial race, both Governor Jay Nixon and Matt Blunt were generating press releases over the state wires at an unprecedented rate. Missouri Secretary of State Robin Carnahan has heated up the fax machines dramatically over the past few weeks. The Republican Party is well aware of the tremendous challenge combating the fiscal policies of an extremely popular President. Blunt commented, "Obama played good cop, promising us if we'd vote yes on his spending plan, he'd work in our ideas, We weren't that dumb..."
Much of the stimulus package allocates funds over four years, heavier in 2011 AND 2012. Many Republican insiders believe the delay in allocating money provides an opportunity. They believe the economy won't recover in the next two years providing a window for a congressional conservative rally. Whether Blunt or Steelman, the republican faithful hope the well of discourse doesn't become too poisoned for cohesion if a primary does ensue. The Missouri Legislature's 29th District Senatorial Seat will be up for grabs as Republicans shuffle in the wake of Roy Blunt's decision to vacate the 7th district congressional seat to compete for the Senatorial slot currently held by Kit Bond. Goodman has scheduled 10 press conferences throughout the 7th District where he'll formally announce his intentions to join the political club known as the House of Representatives. Last year incumbent Goodman's re-election bid for the state legislature was unopposed. Board eliminates pet licenses. Aldermen approved an amendment to the animal control ordinance that eliminates pet dog and cat licenses in the city. These licenses only generated about $550 annually, and Aldermen felt the expense of staff time and implementation of the licenses exceeded the revenue. The amended animal control ordinance will require all dogs, cats and ferrets to wear a rabies tag. Ferrets have been added to the ordinance since a rabies vaccine has been developed for these pets. Fall Creek Road south of Highway 76 will be reduced to one lane of traffic starting this afternoon, February 24. To help manage the traffic and reduce delays, a temporary traffic signal is being installed on the south end of the construction activities. The traffic signal will regulate traffic through the one-lane portion of the road. Motorists should obey the traffic signal as any normal signalized intersection and comply with all traffic regulations. The city of Branson Finance Department held two liquor training classes on February 20 for servers, cashiers and bartenders. This training is required of all businesses selling liquor in the city of Branson or businesses that are in the process of obtaining a liquor license. More than 225 people attended the morning and afternoon sessions at Branson City Hall, which were conducted by the Community Partnership of the Ozarks. It was a festive evening Friday at the 62nd Annual Black Tie Celebration where nine of Branson’s finest citizens were recognized for their contributions to the community by the Branson/Lakes Area Chamber of Commerce and Convention & Visitors Bureau. About 520 people attended the reception and dinner at the Chateau on the Lake Resort, Spa & Convention Center. Many generous Chamber members made the elegant evening possible. The city of Branson has contracted with Emergency Communications Network, Inc, of Ormond Beach, Florida, to provide its “CodeRED” high-speed telephone emergency notification services. The CodeRED system gives city officials the ability to deliver pre-recorded emergency telephone messages to all or targeted areas of the city in case of an emergency situation that requires immediate action. Examples of times when the CodeRED system could be used include tornado or flood warnings; utility outages, evacuations, missing persons, hostage situations; chemical or sewage spills and other emergency incidents where rapid accurate notification is essential for life safety. 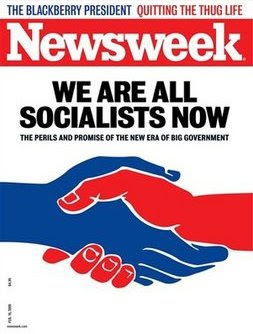 Newsweek Cover - "We're all Socialists Now"
I'm extending my blogging break another week...thanks for all your e-mails!